3 Still Getting Errors ? This is a further sample which querying Sales Cube using JPivot interface. The cube data is derived from MySQL foodmart sample data which we can generate from Mondrian's zip bundle. The sales cube schema is defined in Foodmart.xml file. 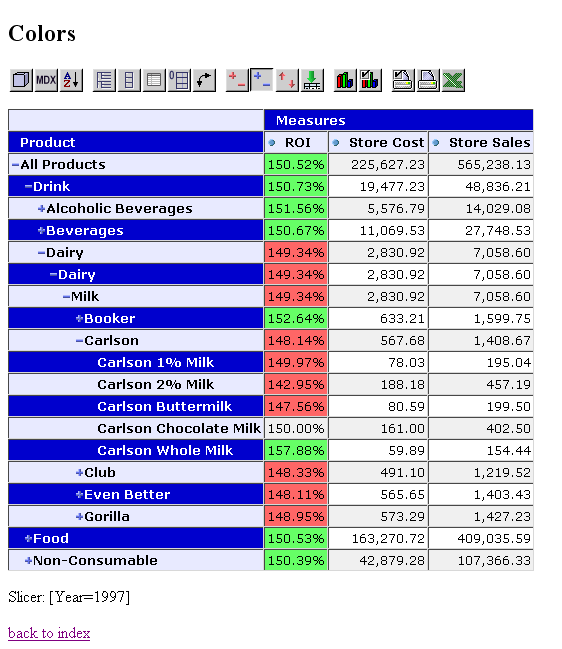 The page shown will by default show 1 dimension (Product) and 3 measures (ROI, Store Cost and Store Sales). ROI iiself is a calculated measure based on Store Cost and Store Sales (ROI = (Store Sales -Store Cost) / (Store Cost) * 100). This time the sample demonstrate an image visualization feature to give us a better insight on our OLAP data. Open your Mondrian web application and click on the sixth sample from the index page (JPivot with colors). You should see an OLAP data table with a JPivot toolbar. Drill through some of the dimension level nodes. For example, my web application is located at http://localhost:8080/mondrian and my "JPivot with colors" sample url ishttp://localhost:8080/mondrian/testpage.jsp?query=colors. Screenshot below shows the page that have been drill through at some nodes. If you already following all the instructions and still got some errors or you have other issues that has to do with other database sources then you can post your problem to our Mondrian user group at http://groups.google.com/group/phi-mondrian-olap. Or you can send a blank email to phi-mondrian-olap-subscribe@googlegroups.com to join the group. Note that you must get approval first before you can post. For those of you in Indonesia we have a regular training on OLAP and data warehousing subject using Pentaho Data Integration and Mondrian. If you want to enroll for the session please feel the form at http://pentaho.phi-integration.com/pendaftaran-training and we will send you the training schedule. And for those who like to have a remote training instead using Webex please contact us by email to support@phi-integration.com.